What do you call the belief of a someone lower in the value chain thinking the players higher up in value chain are just “apps” over their platform? Anshu Sharma a VC at Storm Ventures calls it the stack fallacy. The root cause of companies falling for this fallacy is taking an inside-out approach to product management rather than a customer job-to-be-done centric approach. To use Anshu’s example of database companies wanting to enter SaaS market, the approach should not be to look at SaaS companies as just apps but ask what customer segment and jobs are these customers hiring the SaaS companies for. Fitbit started in lower left quadrant and is trying to move up the stack with its newer devices. Recently it introduced $200 Fitbit Blaze to be one such ‘full stack’ player. If you look closely at the numbers you can see the internal business driver for this product strategy. Here are the Q4 numbers of Fitbit, its high end competitor Apple and its low end competitor Xiaomi. Fitbit’s average selling price (ASP) is stuck at below $90 levels. They could increase total revenue and profit by increasing volume but there is considerable TAM compression due to Xiaomi’s Mi bands that retail for $14-$16. 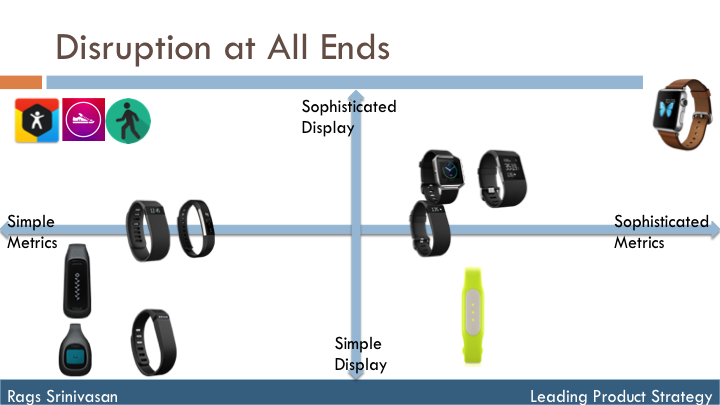 In shortest period since its introduction Mi Bands grabbed as much as 80% of volume of Fitbit. Any growth in that low end of the market is going to be created and captured by Xiaomi. A moment’s reflection will show you a $16 device will bring in even the most skeptical customer to try out a fitness band. For those who are already sold on wearable fitness its low price point is a huge temptation. And the device indeed packs value with its heart rate monitoring and excellent battery life. So Fitbit is looking to move “up stack”, where the ASPs are 4X its current levels and likely much higher unit gross margin. After all if they built core fitness band, isn’t adding smart watch functions just adding apps? Stack fallacy. As proof of failure of this fallacy driven product strategy, its smartwatch Blaze was panned by The Wall Street Journal’s tech reviewer Joanna Stern who calls it, “ugly, barely better at fitness metrics and offers far less value than Apple watch”. How do they pay for it – as in what budget do these customers pay from for splurging on a smart watch? What value do they apportion to fitness metrics collected by a smartwatch? Failure to ask these key questions is Fitbit’s stack fallacy. Not blazing new trails or step in the right direction. ← Do you really need 10,000 steps a day?